This tall vase (about 15 inches)was thrown by me and decorated by my grandson. The clay body is "Sculpture Raku", a type of white/grey clay that can take a lot of thermal abuse without falling apart. My grandson used a clear crackle Raku glaze over most of the surface. The black parts were left unglazed. The blue parts used the clear crackle with some cobalt carbonate mixed in. 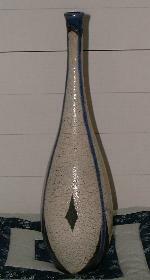 The glaze firing used the California Raku process: Bring the temperature up to the point where the glaze melts and is smooth then pull the pot out of the kiln and put it into a container with combustables like newspaper. The glaze cracks because of the quick temperature change and the smoke from the burning newpaper goes into the cracks to turn them black.